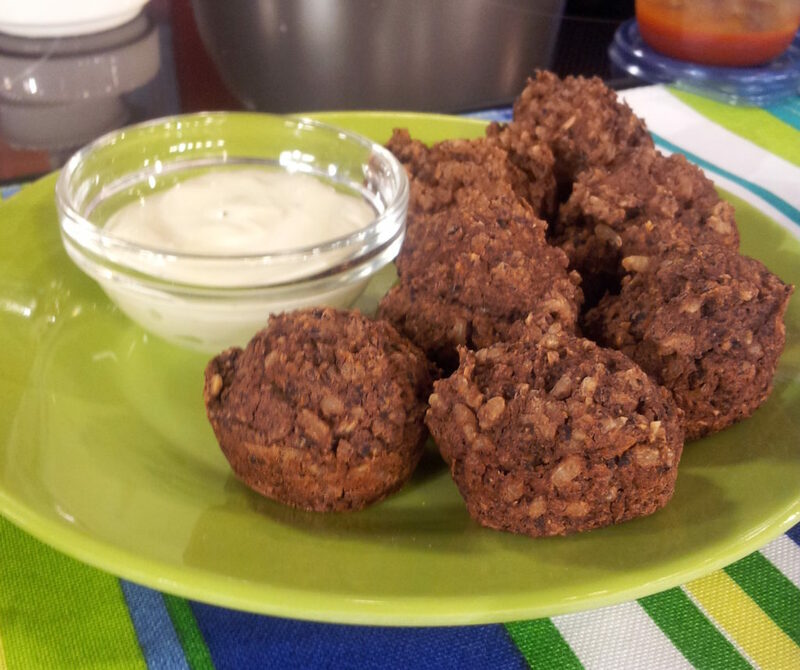 A great way to use cooked brown rice as well as a vegetarian alternative to meatballs! Send them off with some Ranch style salad dressing to use as a dip. You really need a food processor for this one. Preheat oven to 375°F (190°C). Lightly spray or oil a 24 cup mini muffin pan. In a food processor, pulse the carrot until it is in tiny pieces, looks like a fine grate. Add shallot and garlic, and continue pulsing until the shallot is also in small pieces. Add mushrooms, pulse until in tiny pieces. Add cumin, coriander, paprika, basil and rice. Pulse until blended. Add oil and beans. Pulse until well blend but not that it looks like mush! Scoop out 20 veggieballs into the prepared pan. Bake for 45-55 minutes or until the veggieballs are firm. Serve or store in the fridge for school lunches. One serving = 5 veggieballs.